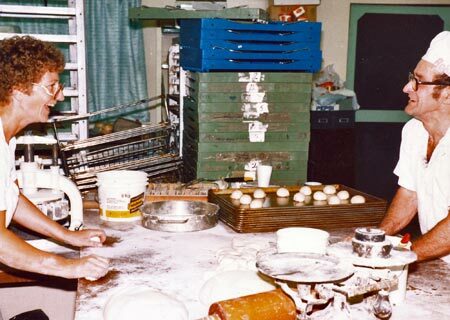 Over seventy years ago, a young teenager from a well-known baking family in Hamilton, Canada, began experimenting in his mother's kitchen. The family now laughs when they recall the messy curtains and counters a patient Mrs. Linkert continually cleaned up many mornings. His first job (at eight) was going with father, Ed, on the bread wagon pulled by their faithful horse, Harry. Eventually, using ingredients bartered in exchange for working in his uncle's bakery, Murray Linkert developed a preoccupation with fruitcake that became only more intense with the passing years. Even during his ten years as a flight instructor and Air Defense pilot with the R.C.A.F., the cake still turned up from a small kitchen oven in his apartment on base. Only able to bake four cakes at a time, he nonetheless would turn out about 400 pounds over a period of months for friends and relatives. In between his teens and service time came several years working for one of the larger and more recognized centres of the profession in the southern part of the province. The cake formula was changed many times, reflective of his belief that "it can never be quite good enough ". In the late fifties, Murray settled his family in a beautiful, eastern section of the Haliburton Highlands, just south of Algonquin Park. 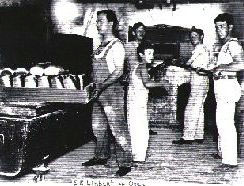 Many local teens had summer jobs with Murray and brother Jack. One girl applied at age 14, was told to come back next year", and as Murray now smirks “And darn it, she did!". After high school, and 12 years of travel and various job experiences, she returned to the Highlands to find her former boss doggedly pursuing that same goal. She trained with him four years, long enough to convince them both, that Janet Barker and Murray Linkert (as partners) made the right team to carry on the dream. For 27 years they worked very hard, building upon the foundation laid down by Murray over the previous years. Their motto became “The difficult we can do, the impossible may be a bit more of a challenge.” Many times the challenges seemed insurmountable but by God’s Grace, and with the help of extremely loyal employees, such as Theresa ‘Mikey’ Davidson and Candy Hutchinson the accomplishments achieved were many. At 81, Pappy was forced to stop lifting heavy pans, and restrict his involvement to non-physical work. 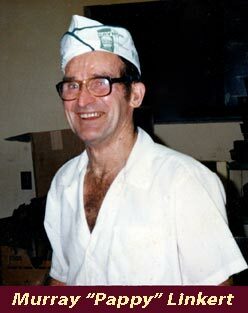 Still a daily fixture, he was always a welcome presence who brought daily laughter and light to the bakery environment. After several frustrating months in 2008, Pappy was set free from his suffering, and in January 2009 he went home to be with the One he so loved and respected, his Friend Jesus. He was an amazing mentor and friend, and anyone who knew him felt honoured to have him in their lives. He was and is, dearly loved and missed beyond measure. "It is better to light one candle than to curse the darkness.